This chapter describes a structure for climate model verification and validation. The construction of models from components and subcomponents is discussed, and the construction is related to verification and validation. In addition to quantitative measures of mean, bias, and variability, it is argued that physical consistency must be informed by correlative behavior that is related to underlying physical theory. The more qualitative attributes of validation are discussed. The consideration of these issues leads to the need for deliberative, expert evaluation as a part of the validation process. The narrative maintains a need for a written validation plan that describes the validation criteria and metrics and establishes the protocols for the essential deliberations. The validation plan, also, sets the foundations for independence, transparency, and objectivity. These values support both scientific methodology and integrity in the public forum. I thank the editors, Claus Beisbart and Nicole J. Saam, for the opportunity to contribute this chapter and for their efforts in putting together this volume. 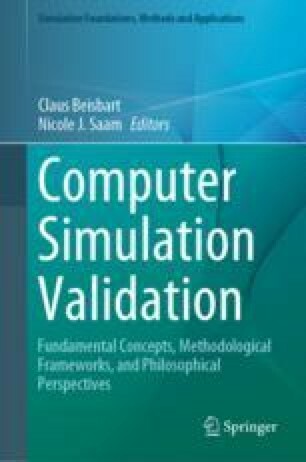 I thank Cecelia Deluca for reading an early version of the manuscript and many discussions on modeling infrastructure, verification and validation, and insights into modeling culture. Data Assimilation Office (DAO). (1996). Algorithm Theoretical Basis Document Version 1.01, Data Assimilation Office, Goddard Space Flight Center. Retrieved from https://eospso.gsfc.nasa.gov/sites/default/files/atbd/atbd-dao.pdf. National Aeronautics and Space Administration (NASA). (2016). Independent Verification and Validation Framework. IVV 09-1, Version: P. Retrieved from https://www.nasa.gov/sites/default/files/atoms/files/ivv09-1-verp.doc. Rood, R. B. (2010). The role of the model in the data assimilation system. In W. Lahoz, B. Khattatov, & R. Menard (Eds. ), Data assimilation: Making sense of observations (pp. 351–379). Berlin, Heidelberg: Springer. http://dx.doi.org/10.1007/978-3-540-74703-1_14.